Okay - so I know I haven't posted for a while. I apologise - it has been a huge month of events and happenings both at school and at home. So grab a snack and a drink, sit down and get comfortable - here is the update for the entire month of February! My friend Janel is what we would call the teacher-librarian at Nisley and I have had some great times with her since we met on my first day in Grand Junction. 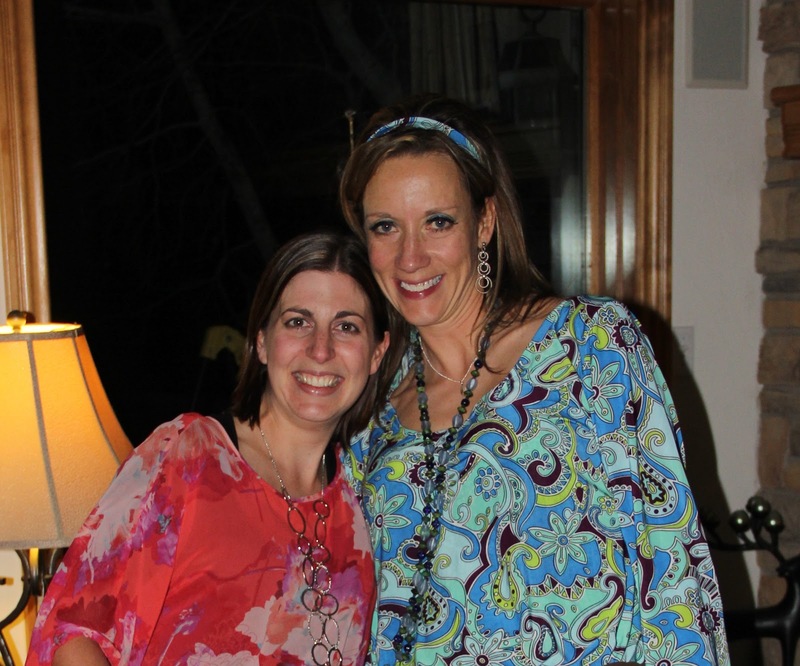 In February she turned 40 and celebrated with a 70s themed party. It was awesome! A small group of teachers from school were invited as well as some of her other friends and family. It was a lovely party with great 70s themed drinks and dancing - I had a great time and I was glad to hear later that Janel did as well! Me and Janel - the birthday girl! One of the hardest moments last month was receiving a call from my parents to say we had lost my Pop. It was tremendously hard not being there in Australia to help support my Nan, Dad and Mum as well as my sister and all my Aunts, Uncles and cousins as they struggled through the loss that first week. Pop's passing was sudden and not what we were expecting to have happen but I was so thankful for the support of my friends - both at home in Australia and here in Grand Junction. Quick responses from friends at home via messages were so welcomed and made the week pass more easily than it could have. I did not feel like I was overseas alone - so thanks again to my friends and family and the wonders of technology. My first interstate 'jaunt' took me 2 hours west from Grand Junction across state lines into Utah. I travelled with Linda, a CITEL buddy and friend, to a little town called Moab. This weekend, at the end of winter, it was not too busy at all. However, from around the end of March (Spring Break time) the crowds arrive and it is bursting at the seams to accommodate everyone. There is a huge pull for mountain biking, hiking, climbing, off road adventures in jeeps (and other vehicles), skydiving, base jumping and river rafting enthusiasts. Linda and I were in Moab to see Arches National Park, which is about 5 miles north of the town. Arches NP has over 2,000 natural stone arches, in addition to hundreds of soaring pinnacles, massive fins and giant balanced rocks. It is a "red rock wonderland" for sure! We spent a good 4-5 hours or so in the park and there is still heaps to go back and see. On this day there was a lot of amazing photo opportunities and red rock scenery - below I have included a few I had on my iPad. Check out the Pages section to the right to see more (I will also hopefully post ones I receive from Linda). A balancing rock - the number of these blew my mind! I kept expecting them to fall right in front of my eyes! Flat land leads to huge red rock formations! On our way out of Arches, we drove on the scenic route - Highway 128 along the Colorado River. I have also put more of these photos from the drive home on the Pages section with the Arches photos. I was lucky to be invited to attend the banquet for Kids Voting this year. Kids Voting USA (KVUSA) gets students involved and ready to be educated, engaged citizens. Students learn about democracy through a combination of classroom activities, family dialogue and an authentic voting experience. (http://kidsvotingusa.org/) Students participate in school based activities based around learning about voting and democracy, which even include actual candidates being involved! At the end of the election period, the students also get to actually participate in an Election Day with voting ballots, booths and the whole she-bang! It sounds like a great program and one I would like to learn more about. Not only was the banquet night to celebrate the end of the year and all those students and schools who had participated in the Kids Voting during the last election, I was astounded at the young people from elementary school through high school who were recognised for selfless achievements in their school and community. They celebrated students who raise funds or look out for those less fortunate than themselves as well as those who work with (or create) non-profit organisations supporting the community. It was inspiring to hear and amazing stories for me to bring back to our students. There is one more event I need to share with you from February and that is my trip to Denver across the mountains via the Amtrak train for the CITEL Snowshoeing day at Rocky Mountain NP. However I will have to post this particular event tomorrow as this post has taken two hours so far and I feel I will not do justice to the awesome scenery and adventure I had at the moment. Hope you enjoyed my February adventures so far - I'll be back shortly to wrap it all up.